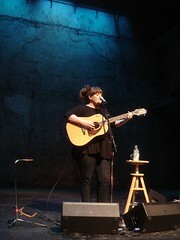 Adele just played at the Theatre De La Jeune Lune (Theatre Of the Young Moon) in the Warehouse District of Minneapolis. This is an age old classic "french-looking" bricky theater, not the typical concert venues that I normally go to. I did a little research on this building, apparently originally founded in France in 1978 by graduates of the theatre school Ecole Jacques Lecoq (Parisians Dominique Serrand, Vincent Gracieux, Barbra Berlovitz, and Robert Rosen). Their history on their website is kind of vague, so I am assuming the company moved the theater to Minneapolis, where it stayed since 1985. Tickets to this particular show was general admission, so first come first seating. There were a few people that got in late and instead of searching for multiple seats in a row, they stood on the side to watch the show. The acoustic sound is amazing in this place, and to be honest, I didn't think that Adele needed a microphone, her voice was loud and clear. She sounded nervous, at first, but once she started singing, it was loudly with confidence. She played and sang on the first two songs, before being joined on stage by her acoustic guitarist (Benjamin Thomas) and keyboardist (Steve Holness)... it was pretty low key, with the music only there to serve Adele's voice. As you can tell by her set list, she did most of her song from her debut album, with four cover songs, which I think are all available as B-Sides or on her debut. The two cover that stood out for me was the nice Bob Dylan tune, "Make You Feel My Love" and the surprisingly punchy Sam Cooke's "That's It I Quit I'm Movin' On". Since there was a lack of additional songs (and a lack of a warm up band), the show was really short. We got out of the venue around nine, which is the earliest I've ever gotten out of a show in a very long time. If you cannot make it out to one of Adele's live shows, the next best thing is you can follow Adele on her misadventures on her US Tour (quite informative and full of pictures of places she'd go). Update: More pictures and videos at Rock and Roll Star and Britrock at the Top. I was at Adele's show last night and I have to say that my friend and I truly enjoyed ourselves. It has been a long time since I saw an artist who did not need the whole band. It was refreshing to know that what you get on her CD is what she gives in an acoustic setting. 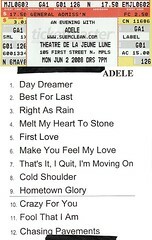 Adele is going to be "HUGE" in the music business so if you do not know her songs I recommend getting her CD. Adele was also very sweet and sincere in her interactions with the audience and that is something that is lacking nowadays. I only wish people would have given her enough respect not to wear sweat pants and flip flops to her show. That was a little tacky. Overall Adele was amazing!!! !